Short and snappy is best. I strive to keep my videos at 10 minutes or less. I present one idea, with a few targeted examples. The videos have worked well in my classes, and students have come in with appropriate questions. This is not to say that all students watched the videos, but the message certainly got out that if a video was missed, you will be behind on the classroom conversation. Most of my videos feature just my voice, but lately I have been recording myself in front of the camera. There’s something odd about the dis-embodied voice in a video, and I think I will try to be live on camera as much as possible in the future. Making videos has caused me to have a sharp focus on objective. I try to keep the rambling to a minumum, although my “embedded secret word” has been popular, and caused me to give out many Jolly Ranchers. I also want students to feel comfortable re-watching videos, if they need. Keeping videos focused helps with this goal. Joel and I have used a few methods to assess that students have watched videos and taken notes. In our last video, Edmodo’s helpful quiz feature was used, but this caused issues for students who watched the video on a mobile device or ipad. I don’t want the assessment to be an albatross or another layer of unnecessary organization. Google forms and Camtasia quizzes were also employed, with mixed success. Getting ready to make a video often takes 3 times as long as making the video. Assembling notes, problems and preparing take time. And as wonderful technology is, one of my favorite videos was done with a webcam and index cards (see below). I have used a number of tools to record my videos, but always publish to YouTube, and share the videos with the students on Edmodo. DOCERI – this fun ipad app allows you to draw on the screen and record your finger strokes with voice. I have used this often for algebra problems. I am able to write the problem on the screen beforehand, and walk students through the work. Here’s one featuring Completing the Square. SMART NOTEBOOK – I like using this tool, along with its recorder feature, for sections where there will be many definitions and details. I can have the pieces all ready to go, hidden, and bring them on screen when I need. Also, if a problem will require a good bit of writing, this format is ideal. Here’s one on Random Variables, from AP Stats. SCREENCAST-O-MATIC – This screen recording tool was useful for guiding students through problems I had ready to go using the Desmos calculator. I didn’t use it often, but the interface is easy to use. The biggest problem with the videos I made with this tool was with the loud clicking from my mouse pad. Note to self – use a wireless mouse next time. This one features the graphs of logarithmic functions. INDEX CARDS AND DRY-ERASE BOARDS – Yep, index cards. Recently, our school had a snow day. I was working on a script for a video on the geometric distribution, and was planning to use Smart Notebook. But it occurred to me that I had everything I needed at home: index cards, poker chips and a laptop with a webcam. YouTube’s editor allows captions to be included, which I used in this video on Sampling Distributions. Just have to work on lighting next time. Getting close to the end of the semester here, with just a few days remaining before final exams. In Algebra 2, one of the last units of the course is on parametric equations. With changes to our HS courses, and having not taught Algebra 2 for many years, I have never taught parametrics before. But a new unit to me became fun and hopefully relevant to my students through technology and some great class discussions. In this short unit, my ultimate goal was to expose students to projectile motion expressed parametrically. This was a contrast to material learned earlier in the semester, where quadratics are often used to model motion and explore max/min of projectiles. Now we had the ability to think about how the horizontal and vertical position of an object were both dependent on the time. After a quick trig review, we used these equations for our projectile problems. Is the Cowboys Stadium scoreboard too low? How far could a punter kick a football? What angles are ideal for punting a football? What are plausible initial velocities? I did have to stop class at one point to explain that a good angle for hitting the scoreboard may NOT be ideal for hitting a punt as long as possible; the two questions I am asking are separate from each other. I was happy with my students’ arguments and hope to do this activity again. 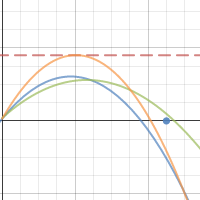 Below, one group turned in most of their work in a Desmos file, which shows an “average” punt, a punt which would hit the scoreboard, and an “ideal” punt for distance. 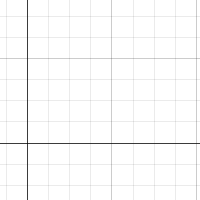 Click below to open the graph. I think it is an equation, and the slider somehow controls the domain. Note, this falls apart some when we get to example 4, the circle. I think the slider controls the value of x, and this controls y.
I think the slider somehow controls x and y. Now we are there. A parameter, here “a”, controls the values of both x and y. After discussion, students opened the folders and observed the structure and behavior of the equations. This opener made the “buy-in” for the need for parametrics so much stronger, and I hope to use this again! You can find more Desmos class files in my Desmos Virtual Filing Cabinet! Can You Defend Your Practices? The most interesting classroom-related Twitter conversation of 2013 took place within the last week of the year, and has carried over to the early days of 2014. An intense debate between a twitter “member” named @StopSBG, committed to “Stop Standards-Based Grading (SBG) in Ankeny Schools”, and a number of education professionals has produced spirited back-and-forth on the nature of grading, standards, test retakes, and what we value in our communities. I can’t fairly summarize the many webs woven and arguments made over the past week, and encourage you to look up Frank Noschese, Ken O’Connor, and Rick Wormeli, and the many others who have joined the conversation. @StopSBG @audhilly @MrFlynnWave @kenoc7 SBG breakdown gives that feedback. Single grade does not. It’s best for student learning. It’s best for student reflection. It’s best for student feedback. And aren’t those the most important things? My opinions on retakes certainly didn’t develop overnight; I read literature, sought out research, shared ideas with colleagues, and found opportunities to hear experts share their ideas (which is much easier with things like YouTube and Twitter around to facilitate self-directed PD). Students – who have mostly been exposed to “traditional” classroom practices. How do I get them to become better learners by investing themselves and trusting in my classroom practices? Parents – who may have legitimate questions about their child’s education. Can I defend how my practices are best for their learning? Also, can I explain my practices without throwing other teachers “under the bus”? The community – who often only hear about schools through quick bites of often mis-leading information. How can I be an effective communicator of how schools are adapting and evolving? This is where the recent Twitter debate has been so fascinating. A chorus line of edcucators, well-versed in best-practices in the classroom, have been debating the nuts and bolts of education policy with a non-education professional. And while I trust some head-way has been made, it will take a lot more folks with the will and persistance of Frank Noschese to deliver clear, well-researched messages in order to forward the national education debate. I find myself often sitting on the sidelines when debates intensify, and I feel the conversations of the last week have given me inspiration to become more involved in 2014….so there’s my New Year’s Resolution! Create a culture where students routinely reflect upon their progress. Provide opportunity for students to communicate their strengths, weaknesses, and needs. Allow for multiple opportunities and avenues to demonstrate skill mastery. I appreciate the vast network of professionals I have connected with through Twitter, and their kind assistance in helping shape my goals. It’s quite a time to be an educator…it’s also a better time to be an cheerleader of best practices!